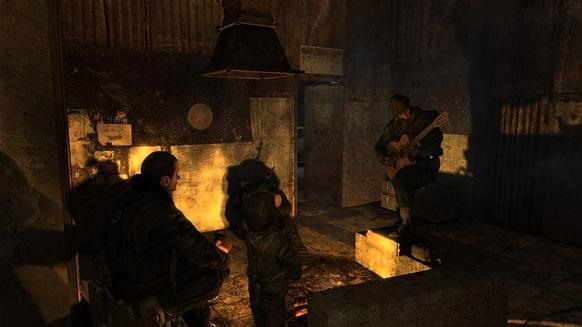 What separates Metro 2033 from other FPS games? Life. There are underground towns, markets, children, music, and so much background chatter than sometimes you can't single out a particular conversation. Most FPS, especially American shooters, are streamlined for Adventure and instant action. These games like Modern Warfare, Call of Duty, and dozens of less successful FPS games out there take you from one action packed location to the other. The most you might ever see from these games is a cut scene and an equipment screen, where you can upgrade/buy/change your current items. Right after those screens, you're trusted to the action again. I actually don't have anything against this, but it's nice when there is variety, at least more than just 'shoot'. The way the game is structured gives the player the ability to become more involved in the game. 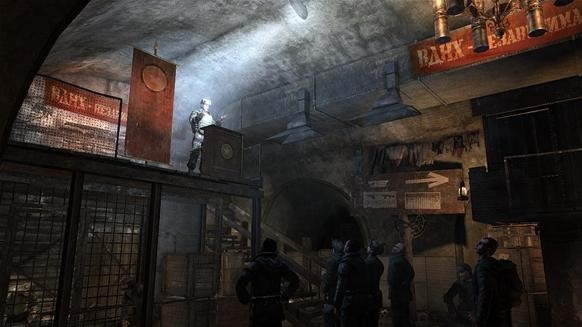 The game is mostly set in a vast underground metro system with many nodes, or stopping points between passages. In each node there is always something: a small town, a market, a station. In these places, the areas are usually full of life and character. There are small man made apartments, where even if you can't get in, you can knock or peek in. These apartments are individually decorated with their own personalities. In the first town, the player is placed in the main character's home town. Whoever you approach knows you and gives you a comment, you're just not a stranger to these characters. This is a nice contrast to the reception you get in other locations, where the player receives a cold shoulder because the player is not known to that area. As you walk around you can see random events, things that do not revolve around you. The player can miss them entirely and they are not repeated. Above is a picture of a speech around a minute long, and after it ends everybody leaves. This is something that is not repeated endlessly to make sure that the player experiences it. It's great that the life of the town does not revolve around the hero, and the player is just like any other character in the town. The amount of people in each town is a welcome change from the usual few scattered NPCs in most FPS games. You'll see people standing around, sometimes begging for money. Kids will stare at items they want or play with other children. Most of the time you'll see apartments above and below your current level, giving the player a sense that no space is wasted in these subways. Walking around a town, it's great to hear people talk. There is so much talk between multiple NPCs that it turns into actual chatter and it really immerses the player into the social aspects of the area. Approaching a character, you can faintly hear their conversation better but in some locations there is so much talk going on around you that it's hard to still make out what exactly you want to hear. If you walk around people acknowledge you, or maybe they'll just keep on telling their stories or concerns. 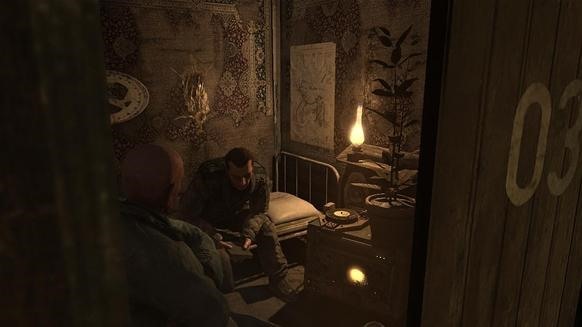 The constant chatter is much better than in other games, where NPCs only talked when you approached them. 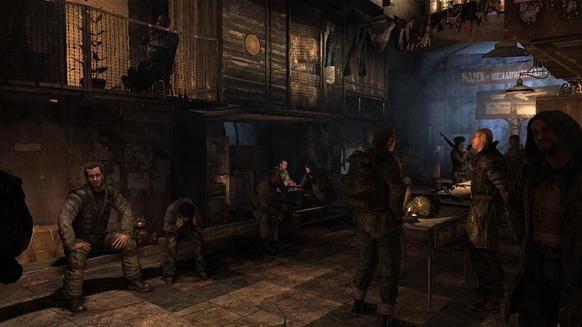 In Fallout 3 for example, any town that you went to was deadly quiet, and only made noise when you actively approached a character for conversation. Music is often heard in town. People sing in Russian, listen to records, or even play an instrument. In this one town I heard a guitar from a distance. Very clear and sharp notes. I walked through the maze of the town to find it, and I'm treated to a personal scene of an NPC entertaining his friends over a small fire. You can't see it in the picture, but when you look at the walls to the right side, the fire flickers the shadows up and down just like a regular camp fire. In the future, if mankind is ever to survive, they will need bacon. Lots and lots of bacon. It's nice to see in a game explanations or examples oh how the people in the story survive. Actual food that does not magically appear or is prepared in some unknown place. 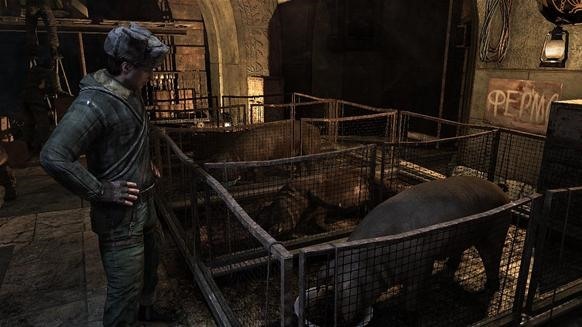 Walking around town there are pigs that are raised for food and butcher shops. There is some sort of weird herb that I keep seeing around. I've seen the rooms where they store and dry them, and they appear to be some sort of herbal spam. Maybe it's soilent green, good for them. All these examples of life are a welcomed surprise. 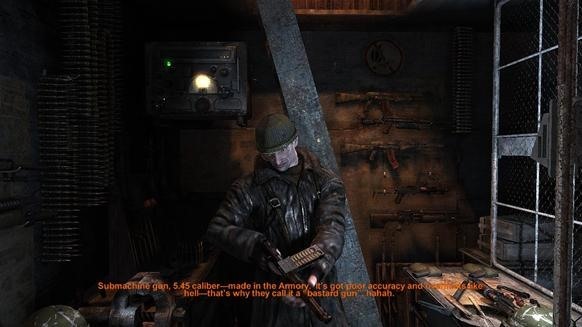 Not knowing much about Metro 2033 before playing it, thinking it would only be a pretty action FPS game. The towns are larger than expected and their complexity blew me away. 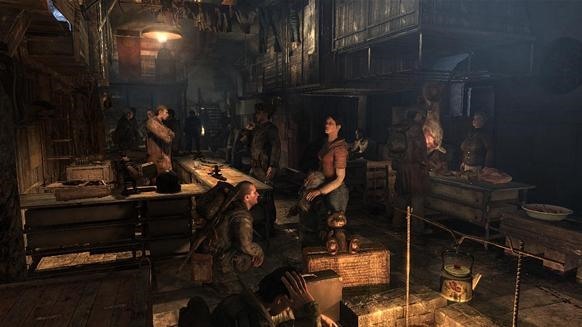 The way the towns are structured, the constant talk, music, and small interactions with the NPCs can immerse a player more deeply than just going from one action filled zone to another. There is a lot of detail in this game, and it's very much welcomed for the players that like to step back and appreciate it.